This Schlage B660P is a heavy duty single cylinder deadbolt that is operable via key on the outside or large thumbturn on the inside. It is designed for wood or hollow metal doors and it is finished with a satin chrome color. Used as reliable extra protection on exterior entrance doors or in areas where security is necessary to prevent unauthorized entrance. The Schlage CO-100-MS-70-KP-RHO-626 is an offline electronic pushbutton lock with 500 use codes that can be easily added or deleted at anytime, right at the door. User rights for the CO-100 are stored on the lock. The CO-Series from Schlage makes it easy to upgrade from traditional mechanical solutions to electronic access control. Electronic access control provides added security, convenience and efficiency. Weather resistant. The Schlage ND80JDEU-RHO is a electrified Storeroom function lock and are available for electrically locking and unlocking controls for high security and fire safety applications. They are UL Listed and rated for both fire and electrical single-point locking on labeled doors. The Schlage CO200-CY-70 PRK with Proximity + Keypad is an offline electronic lock with 2000 use codes that can be easily added or deleted at anytime, right at the door. User rights for the CO-200 are stored on the lock. The CO-Series from Schlage makes it easy to upgrade from traditional mechanical solutions to electronic access control. Electronic access control provides added security, convenience and efficiency. Weather resistant. This Schlage ND12D is a ANSI Grade 1 Exit lock commercial lever lock. This lock works great on many heavy duty applications such as in schools, hospitals, offices, retail spaces, colleges and universities. The toughest cylindrical lock for heavy-duty commercial applications. Schlage ND82PD institution function Extra Heavy Duty commercial cylindrical lever. ANSI Grade 1 locks designed for use in schools, hospitals, offices, retail spaces, and colleges and universities. Built for heavy duty applications. The Schlage CO-100-993R-70-KP-RHO-626-BD is an offline electronic pushbutton lock for use as Exit device trim with compatible exit devices in retrofit or new construction applications. 500 use codes that can be easily added or deleted at anytime, right at the door. User rights for the CO-100 are stored on the lock. The CO-Series from Schlage makes it easy to upgrade from traditional mechanical solutions to electronic access control. Electronic access control provides added security, convenience and efficiency. The Schlage CO-100-993R-70-KP-RHO-626-JD is an offline electronic pushbutton lock for use as Exit device trim with compatible exit devices in retrofit or new construction applications. 500 use codes that can be easily added or deleted at anytime, right at the door. User rights for the CO-100 are stored on the lock. The CO-Series from Schlage makes it easy to upgrade from traditional mechanical solutions to electronic access control. Electronic access control provides added security, convenience and efficiency. The Schlage ND80EU-JD-RHO is a Fail Secure electrified Storeroom function lock and are available for electrically locking and unlocking controls for high security and fire safety applications. They are UL Listed and rated for both fire and electrical single-point locking on labeled doors. Prepped for Schlage full size IC core. Core not included. The Schlage CO-100-993R-70-KP-RHO-626-PD is an offline electronic pushbutton lock for use as Exit device trim with compatible exit devices in retrofit or new construction applications. 500 use codes that can be easily added or deleted at anytime, right at the door. User rights for the CO-100 are stored on the lock. The CO-Series from Schlage makes it easy to upgrade from traditional mechanical solutions to electronic access control. Electronic access control provides added security, convenience and efficiency. This Schlage ND73JD is an interchangeable core lock set which allows for immediate rekeying of the door by using the special control key to replace the Schlage full size core in seconds. The Schlage CO-100-993M-70-KP-RHO-626-PD-is an offline electronic pushbutton lock for use as Exit device trim with compatible exit devices in retrofit or new construction applications. 500 use codes that can be easily added or deleted at anytime, right at the door. User rights for the CO-100 are stored on the lock. The CO-Series from Schlage makes it easy to upgrade from traditional mechanical solutions to electronic access control. Electronic access control provides added security, convenience and efficiency. This Schlage 09-456-12A is a lever and rose trim set. Complete package includes a lever, a rose, mounting screws, a mounting plate, spring cages, and a strike box. This set is used with Entrance or office, entrance/office with deadbolt, corridor with deadbolt, or dormitory with deadbolt function mortise locksets. The Schlage CS210 Interconnected Entry Lock features single motion egress, retracting both the latch and deadbolt simply by rotating the inside lever. This Schlage L9453-ACCL-619 is a mortise lock set with the entrance/office with deadbolt function. With L style escutcheon and Accent lever in satin nickel finish. This Schlage ND80JD is an interchangeable core lock set which allows for immediate rekeying of the door, by using the special control key to replace the core in seconds. It operates with the storeroom function which is always locked on the outside lever necessitating a key for entry and the inside lever is always free. Schlage A53PD keyed entrance knob lock with a 5" extended backset is a standard duty grade 2 commercial and heavy duty residential lock. 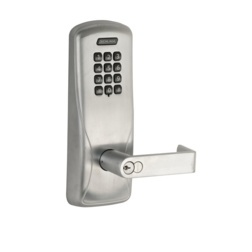 Keyed entrance function with dual locking, turn/push-button locking keeps outside knob always locked. Pushing button kocks outside knob until the inside knob is turned or opened with key. The toughest cylindrical lock for heavy-duty commercial applications. Schlage ND50PD entrannce function Extra Heavy Duty commercial cylindrical lever. ANSI Grade 1 locks designed for use in schools, hospitals, offices, retail spaces, and colleges and universities. Built for heavy duty applications. The schlage B660P single cylinder deadbolt not only provides added protection for exterior entrance doors, they can also protect common use areas like pool gates and storage/utility spaces from unauthorized access. Choose the 600 series for Grade 1 security in high-traffic commercial applications. Schlage ND70JD with 2-3/8" backset interchangeable core classroom function commercial lever for heavy-duty commercial applications. Schlage interchangeable core (FSIC) locksets allow immediate rekeying at the door simply by using the special control key to replace the core in seconds. The toughest cylindrical lock for heavy-duty commercial applications. Schlage ND10S passage function Extra Heavy Duty commercial cylindrical lever. ANSI Grade 1 locks designed for use in schools, hospitals, offices, retail spaces, and colleges and universities. Built for heavy duty applications. 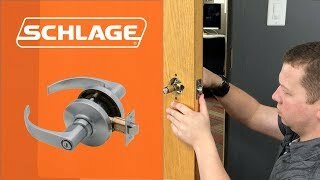 The Schlage ND95PD classroom security lever with Vandlgard. Vandlgard prevents damage to internal lock components caused by excessive force from hitting or standing on the lever to gain access. Vandlgard is ideal for areas subject to abuse or anywhere vandalism is likely to be present, such as schools, universities, offices and commercial/public buildings. The Schlage L9056LB Entrance/Office With Automatic Unlocking mortise lock body is ideal for use in schools, hospitals and factories where the hardware must deliver consistent, dependable operation and stand up to constant use and abuse. For interior doors in commercial applications. The Schlage AL44S Hospital privacy lever. Privacy- push-button locking inside. Turn inside lever or close door to release button. Unlocked from outside by turning emergency turn-button. Inside lever always free for immediate exit. The toughest cylindrical lock for heavy-duty commercial applications. Schlage ND70PD-N12-307-626 lead Lined classroom function Extra Heavy Duty commercial cylindrical lever. ANSI Grade 1 locks designed for use in schools, hospitals, offices, retail spaces, and colleges and universities. Built for heavy duty applications. The schlage B661J single cylinder Blank Plate deadbolt not only provides added protection for exterior entrance doors, they can also protect common use areas like pool gates and storage/utility spaces from unauthorized access. Choose the 600 series for Grade 1 security in high-traffic commercial applications. The Schlage B661J comes prepped for full size interchangeable cores. 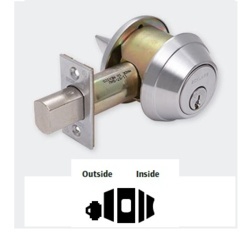 The schlage B662BD IC double cylinder deadbolt not only provides added protection for exterior entrance doors, they can also protect common use areas like pool gates and storage/utility spaces from unauthorized access. Choose the 600 series for Grade 1 security in high-traffic commercial applications. The Schlage GF3000SM Electromagnetic Shear Lock model provides a low profile surface mount lock for outswinging metal door and frame, glass door with top rail and metal frame, or wood door and frame. Dependable performance for exterior and interior doors in commercial applications. The Schlage S80PD Storeroom lever is best for buildings with light traffic flow, such as interior office doors. Dependable performance for exterior and interior doors in commercial applications. The Schlage AL80PD Storeroom lever is best for buildings with medium traffic flow, such as interior office doors, banks, retail spaces and hotel guest areas. Schlage - PS906-4R-FA Special Order Power Supply with 4 Relay Ouput and Fire Alarm Relay. The Schlage 906-4R-FA 4 Relay Output Board w/ Fire Alarm Relay power supply.